SVD 500 PLUS: DVD ready - HDTV capability. A superior technical specification and stylish design combine to create a unique mix of performance and elegance. The SELECO SVD 500 PLUS accepts input signals with 15-16 KHz and 31-38 KHz horizontal frequency which allows you to display high quality video sources (PAL, NTSC, SECAM), the interlaced Grand Alliance HDTV as well as Personal Computer images (VGA, S-VGA). Equipped with long life high brightness 7" CRT's and high definition fully colour corrected lenses. The 100% modular design guarantees high reliability and ease of service. Dynamic Focus for improved screen edge definition.The SELECO SVD 500 Plus is software controlled for convergence and set up, both performed by remote control. 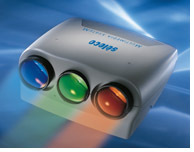 User-friendly on-screen menus allow to save up to 25 different projector configurations in the memory manager.The internal Line Doubler permits superior improvements to video images by increasing the scan frequency of the incoming signal (progressive signal, line doubling, field doubling), by reducing noise, improving sharpness and stabilizing the picture - for an image quality only available from CRT technology.